vignette design: Who Are Your Design Mentors? I should probably add Ralph Lauren and Laura Ashley, too. 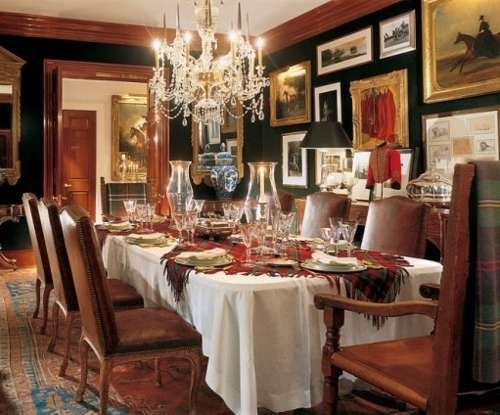 Ralph Lauren and Mary Emmerling are my biggest design wannabes as well. Love your home and all the "layering" you've done. I just downsized and am now in the midst of trying to cozy up/layer up my cute little house. Keep it up...love your style!! I totally agree with you. I love inter-matching patterns and color and a certain amount of opulence. I just can't get into the "all white" thing...love it in photos but I need to be surrounded by color, design, and elegance. The designers you mentioned are all inspirational...and timeless. Ralph Lauren is my absolute favorite. 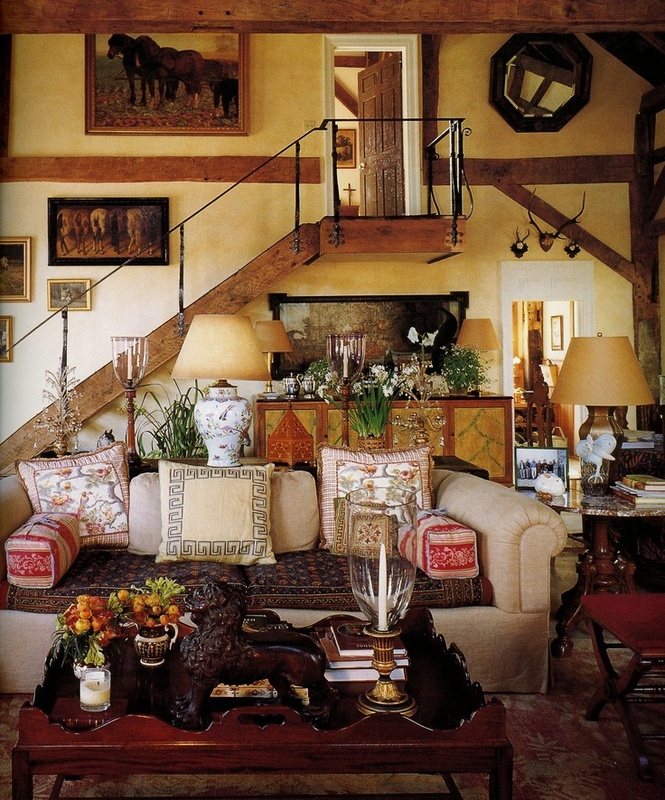 history, seem to me, to wrap a home and create a tasteful, welcoming and inviting atmosphere. have a wonderful eye it was a delicious treat. Sister Parish was the biggest influence on my design. Her look of unstudied comfort, unpretentious, pretty and class all rolled up. Mary Emmerling because I love antiques and she made a home look fabulous using antiques. Rachael Ashwell promoted slipcovering but if you go back to Mary's original books and in her magazines, she always had white canvas slipcovers. 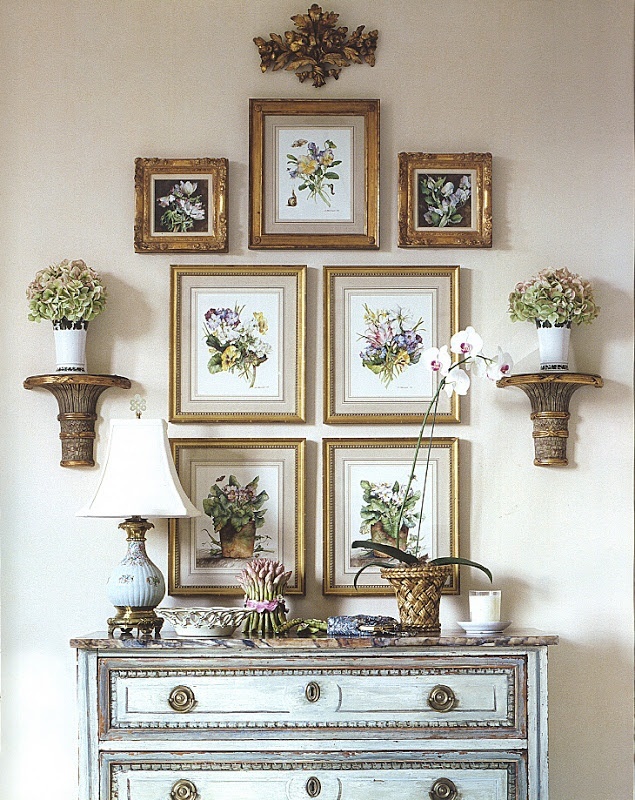 Mary Emmerling also changed styles but never compromised comfort and her places always looked homey. I hate this minimilist look, you never want to to go into those rooms and feel like staying. The NEW designer I like is Sarah Richardson, she has similar style but uses great sparks of color, antiques and comfortable seating in rooms. 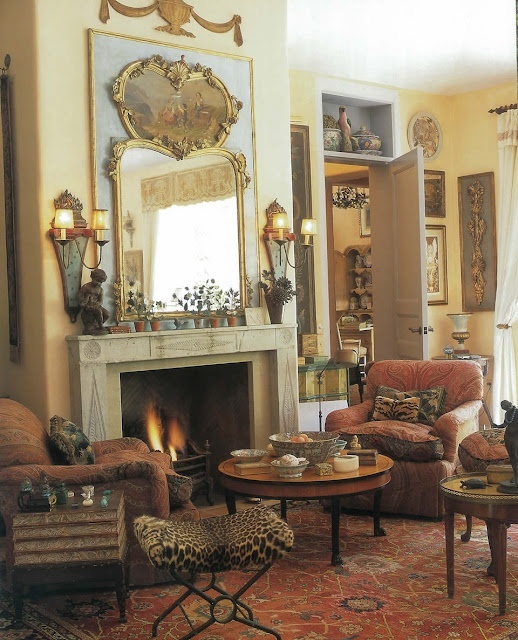 I've always liked Mary Emmerling and although I hadn't heard of him I do like the room you posted by Charles Faudree. Also love Sarah Richardson - so classic. But I agree with the comment by Sarah - the very first person I thought of when I read the title of your post was YOU! 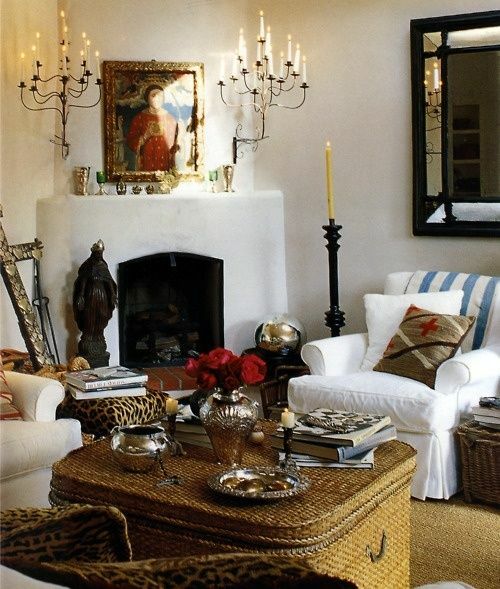 Your decorating is so warm and homey and classic, yet has lots of whimsical touches which I love. I agree with Windmill Farm, Sarah Richardson's design style is wonderful and fresh! Jackye Lanham is another designer who's mix of muted colors and traditional elegance, sprinkled with some industrial touches, speaks to me as well. And, of course, we all love Ralph! I have so many mentors all for different reasons. You're one of my favorite mentors in blog land! Bloggers are very generous with sharing the experience of the entire design, demo, and selection process. Thank you for your generosity in sharing your homes! ( family, garden, and dogs too). 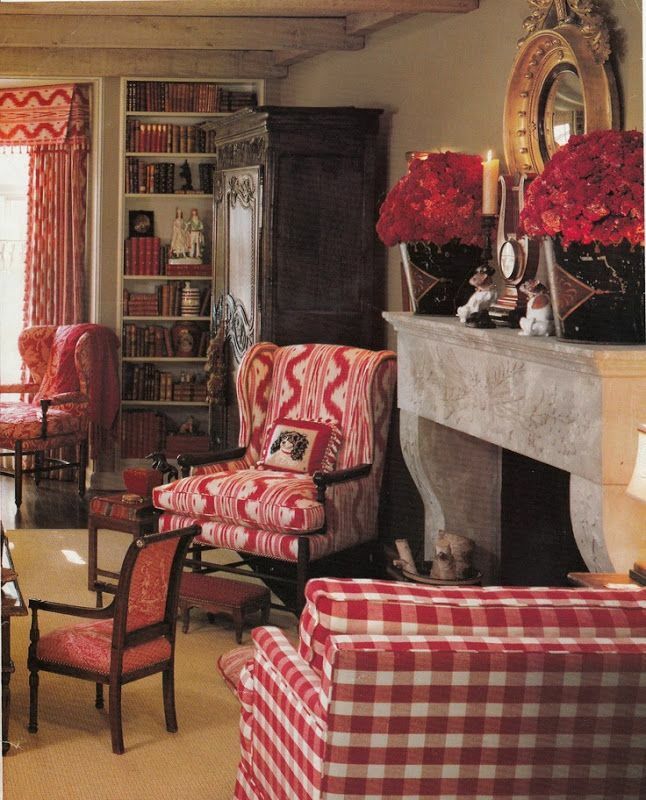 I don't even know the names of the designers, but Traditional Homes is a magazine I like to clip and copy. The internet is a big source of ideas for me, with your site topping my list, Pat at Back Porch Musings and Rhoda at Southern Hospitality are another couple. I like many of the designers you list as well. I've had my eye out for the rustic silverware on your table...maybe someday! I have to saw your list is exactly like mine. I would add Sarah Richardson to my list too, because I love the way she mixes and matches fabric patterns in a modern way. Amazing...last night in bed I opened Mary Emmerling's book "Romantic Country" to begin reading it for about the 20th time! I have enjoyed being inspired by Ralph Lauren for many years. Then came Rachel Ashwell, I love white slipcovers but could never totally give in to all the cutesy pastels for accent colors. I need some grown woman richness in my soft color choices. I do love a French Country mixture and there are so many wonderful designers that go there. I forgot to add...I have 27 yards of a 25 year old Ralph Lauren gorgeous heavy linen fabric that I have hung onto for over 8 years. I bought it to use for a sofa (or two matching chairs) slipcover, so I thought way back then. It is so beautiful in a muted spice/russet/rose/pale olive stripe mix, looking more spice all over. After getting it for just 56 dollars, yep!, I fell in love with those crazy white slipcovers and since then have put the bolt on hold. I refuse to get rid of it and I also have a gorgeous coordinating floral RL fabric too that would look heavenly on throw pillows. One day I will make these fabrics work into my home and actually USE them. 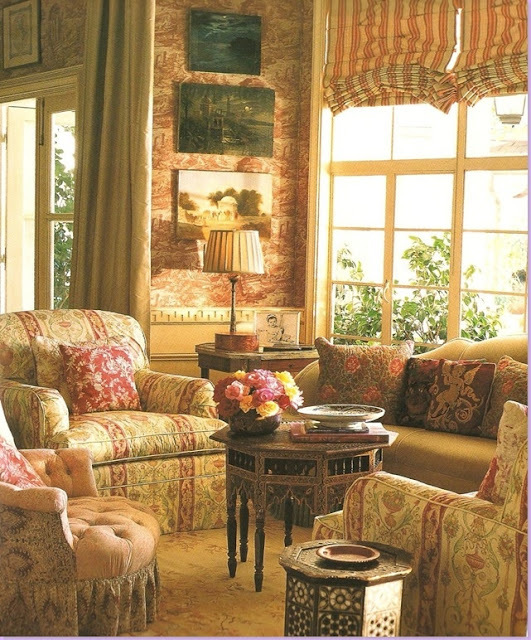 The current slipcover color trend may be different now but traditional Ralph Lauren NEVER goes out of style. I just need to get away from trends and find a way to tweak them in. I say all of this because reading your blog is so inspirational. You stick with what you LOVE no matter what colors are in right now and it looks so good. Your blog has encouraged me to do the same thing. Your home and other property is absolutely beautiful! John Saladino is my favorite designer and then it is Charles Faudree next. Oh, so many - and Pinterest and blogs cause me to bounce all over. But I do love Barclay Butera, Ralph Lauren, India Hicks and Sarah Richardson! So many....Dan Carither, Ralph, Mary McDonald, Charlotte Moss, Barry Dixon, Cathy Kincaid, Leta Austin Foster, Phoebe Howard...so many!! Oh, Delores, seriously you have been on my mind for the past week and a half, seriously! And to then see you visit me in all my whiteness was a shock. I would have to say that you hit the nail on the head with these designers and crafted designers, I hear you with starting out with budget decorating tips...even now the biggest designers throw in a budget find, a rare thrift find in up-styling it to something of great appeal and demanding attention in the room and many times its a piece that was an ridiculously inexpensive piece, yet anchored with the right edgy pieces it speaks volumns ! The chest I just painted I will show off more of it in the tiny space as soon as the flooring is done, it was a high point piece Baker Milling Road piece we had in our family in my young years of designing in the mid 70's under my mother to ten take of in designs later in the early 80's the piece has been bounced around in my home, and at one time in my shop where know one wanted it...Why? It was a beautiful piece , maybe due to size for its use...French empire and great charm, I took it home to then find out if I were to replace it and this was after I painted it that I found this out, that it was worth in the price range of $5,000,00 dollars. Thank you for your beauty, as always you do nothing less then perfection over here !! How is your guest cottages doing, has the guest book taken on the many visiting stays. What did you cover those amazing views with...window dressings that is. I was just on a shoot with Fifi in Santa Barbara Ca. My stopping grounds for a day here and there that inspires and they used armoire and cabinet doors, old ones that is to cover there windows as shutters, they were washed in old tone of terra cottas, grey's, and whites giving it a French European cottage feel, Ty Warner next door, Opera up the street and what an amazing eclectic look from rustic to the ultimate designs you can imagine. I meant to spell ....Oprah! Ps, void any other misspells lol!